Sitting roughly halfway along the Connecticut shore of Long Island Sound, Guilford, Connecticut is the perfect place to put in for a night…or spend a season. Something of a well-kept secret, Guilford offers excellent marine facilities geared toward small to mid-size boats in a quietly elegant location conducive to rest, relaxation and casual summer fun. Long Island Sound does not have many islands of consequential size, making Falkner’s Island easy to spot on a chart or from onboard. The heart of Guilford’s boating zone sits on the mainland shore, just north of Faulkner’s Island. Find Faulkner’s, look northward, and there is the little gem of Guilford. More specifically, a pair of channels that share a common entrance leads to the primary service locations for boaters visiting Guilford. The regularly dredged west “fork” of this channel leads to several boatyards, marinas and the very guest-friendly Guilford Yacht Club. Amongst the services available up the West River are a fuel dock, MSD pump-out, mechanical and yacht repairs, and of course dockage for boats up to about 60 feet with power hookups, and high quality guest services ashore. Alternatively, boats can proceed up the more easterly channel fork to the Guilford Town Marina. This compact harbor features a town-managed marina, a public boat launch ramp with parking for boat trailers, and several excellent choices of seafood-oriented dining. A short walk away is Jacob’s Beach, with lifeguarded swimming, a kids’ playground, picnic areas and more. A bit further up the East River are a handful of town-administered moorings. First time visiting boats will perhaps find that the West River channel is more easily navigated as it is dredged deeper and more frequently, it makes a straighter run from entrance to the protected dock areas, and it has a very visible pair of blinking range lights on the Guilford Yacht Club property to guide boats in after dark. Neither the west or east channel is especially tricky to follow, although it is important to identify clearly and commit early to the fork you’d like to take. Shallow water and a few underwater rocks do separate the two paths. Both channel forks are dredged, with the west route maintained more regularly and to a deeper controlling depth (nominally 6 feet at mean low water). As with all dredged channels the depths change over time, with better soundings typical of the spring into summer, and somewhat less reliable bottom contours in the fall. If a transient slip is booked at the Guilford Yacht Club and there is concern about the low tide channel depth close to the mainland shore, GYC maintains two “picnic hook” moorings in a 6-plus foot deep basin to the west of the channel. These moorings are a convenient place to wait for the rising tide to provide a stress-free transit of the channel. The GYC dock office (203-415-3427; VHF channel 71) can provide lat/lon coordinates for the moorings to inbound guests. Basic dockage and very friendly, helpful service can be booked at Brown’s Boatyard (VHF channel 16), Bayberry Creek Marina (203-453-0792) and Guilford Boat Yards (203-453-5031), all located on the west side of the West River. More “upscale” dockage is available at the Guilford Yacht Club on the east shore of the West River. The GYC facility has spacious and immaculate bathrooms and showers, a heated swimming pool, tennis courts, WiFi on the docks, a daily casual lunch grill, ice, and a fish cleaning station. Brown’s has a Travelift, a fuel dock and a small ship’s store. Guilford Boat Yards has a more complete chandlery. A pump-out station is located on the northernmost dock of the GYC. 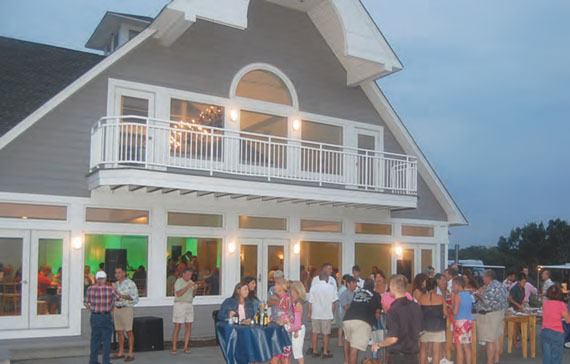 The Guilford Town Marina (203-453-8092; VHF channel 9) on the channel’s east fork has less transient space than the combined operations noted above to the west, but the Town Harbor’s vibrant restaurant scene makes this a must-visit site. From the GYC it is a few minute’s walk through a pleasant residential neighborhood to the Stone House Restaurant and companion Little Stone House café-style annex, the Guilford Mooring Restaurant, and a rustic lobster pound restaurant, all with great views of the waterfront and Long Island Sound. From any of the marinas a short tender ride can be taken, hugging the shore, to the Town Marina. Of course, exploring the town of Guilford by foot, bike, taxi or Segway is essential to a complete visit, but a number of businesses in town will come to you, providing goods and services dockside to make your visit as easy as possible. The Guilford Food Center (203-453-4849) offers delivery service, as does Bob’s Bottle Shop (203-453-3716). Numerous local restaurants also have delivery service, and the Stone House Restaurant will pick up and drop your party off with just a bit of advance planning (203-458-3700). If you need something special, Guilford businesses will find a way to look after you. Guilford looks and feels exactly the way you imagine a quintessential New England town to be. 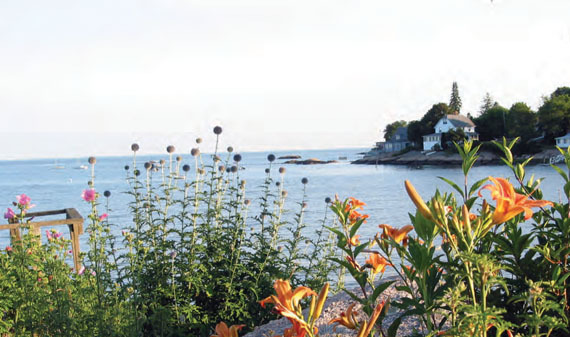 The shoreline town is steeped in history with picturesque streets, scenic vistas, a historic town green and extraordinary homes that date back to the 1600s. With art galleries, parks, beaches, tree-lined walks, fishing, boutique shopping, farm markets, fine dining and hiking – all within striking distance of moorings – it’s hard not to find something to interest people of all ages. Money Magazine named Guilford one of the Top 100 Places to Live. You will be glad you came and tempted to stay longer. Famous for its landmark Green, Guilford boasts architecturally significant homes and museums. The Dudley Farm, a 19th Century farm museum, has a restored farmhouse, barns and grounds that allow visitors to experience life as it once was. The Henry Whitfield State Museum is a national historic landmark and the oldest stone house in Connecticut. The Hyland House is a living museum of 17th and 18th Century life and architecture. The Thomas Griswold House Museum includes a circa 1774 New England saltbox house, an early blacksmith shop, a large barn filled with farm implements, two corn cribs and a Victorian three-seat privy. The Medad Stone Tavern Museum was built in 1803 by Medad Stone to serve as a tavern, but it never opened. The building has 14 rooms and 10 fireplaces. It was restored and opened as “the tavern that opened 200 years late.” The property also holds a barn, corn crib and extensive fields. All of these historic landmarks offer special, seasonal programming. Guilford has extensive trails for hiking, biking and riding in a charming New England setting. Just south of the Green, you’ll discover breathtakingly beautiful coves, seascapes and beaches for kayaking, sailing, swimming and fishing. Take a ride along scenic Route 146 for a glimpse of tidal rivers and marshes, or head north along Route 77 where the scenery changes and pastoral farms and beautiful countryside delight sightseers. Guilford has several public beaches. Daniel Avenue Beach and Trolley Road State Beach are small and peaceful. Jacobs Beach is a 25-acre beach with a playground and athletic courts, and Lake Quonnipaug is a 41-acre beach with camping and kayak and paddleboat rentals. Bittner Park has a roller complex, fishing, horse trails, ice skating, and cross country skiing trails. 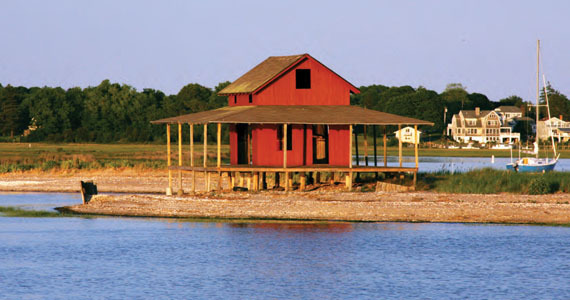 Chaffinch Island can be reached by kayak and has picnic tables, grills and fishing. Shell Beach is the perfect place to go clamming. Guilford is home to many varied trail systems for pedestrians and non-motorized bikers. The Bluff Head area is Guilford’s most dramatic geological site, rising 600 feet above sea level and offering views of Long Island Sound. It connects to the larger Northwoods trail system. The Westwoods is 40 miles of trails in southwestern Guilford containing a wide diversity of fascinating natural formations including cave structures, waterfalls, salt and freshwater marshes, an inland tidal lake and naturally carved rock formations. Bishop’s Orchards Farm Market & Winery and Strawberry Hollow Farm offer opportunities to “pick your own,” hayrides and other fun family activities. Other unique ways to see all that Guilford has to offer include taking a tour with CT Bike Tours, riding a Segway with Shoreline Segway, or viewing the town from the water with Grass Island Cruises. You can choose from three historic walking tours, each encompassing the Guilford Historic Town Center. One tour focuses on the history of Guilford and includes three house museums. The second focuses on architecture within Guilford’s historic districts. The third is a self-guided walking tour on the town green conveying the significant people and events that are a part of the town’s history. Whether you’re enjoying a stroll around the historic Green area or traveling along Route 1, you’ll find numerous independent shops offering an impressive variety of jewelry, clothing, accessories, books, culinary treats, original artwork and more. Of particular interest is the Guilford Art Center. Located at 411 Church Street, the Center was founded in 1957 to support excellence in the arts. The Center’s school, gallery and shop of contemporary crafts provide opportunities for the public to participate in the arts, and appreciate the process and product of creative work. The store, called shopSPACE, is open Monday to Saturday from 10 am to 4 pm, and Sunday from 12 to 4 pm. 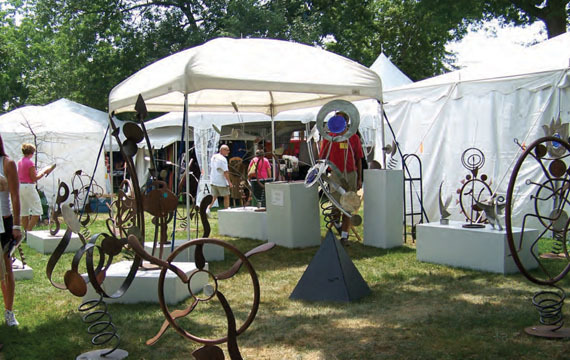 Each summer, the Guilford Art Center hosts Craft Expo, a must-see event that brings more than 175 nationally recognized craft artists to the Guilford Green for one of the top craft shows in the country. This year’s Craft Expo will be held July 18 – 21, and it’s open from 12 to 9 pm on Thursday and Friday, 10 am to 7 pm Saturday, and 12 to 5 pm Sunday. Guilford has a variety of restaurants that will please every palate. Satisfy a craving for pizza, Asian cuisine, Mexican fare, or just a great breakfast. It’s easy to find a place to fulfill every wish. Some of our great establishments will even deliver dockside! When planning your visit to Guilford, be sure to check out the Chamber of Commerce’s website at guilfordct.com, and their discount coupon program at destinationdiscountsct.com, where you’ll find great deals offered by local merchants. Sail New York City and Newport: No Boat Required! NOAA’s New Northeast Chief’s first official act – Undermining the Marine Mammal Protection Act?